Green meets pink with the thrift store stove I moved from the kitchen. The floral plates relocated from over the crib. My husband hates this bird lamp with a passion, but I still keep giving it a place of honor. And here's the best buy of the week: an old metal chandelier. Originally overpriced at $25, no one bought it...until I scooped it up on 99-cent day. What would you do to make it fabulous? Leave it white? Add colored shades? Something fanciful with ribbon? What a great find. I'd add shades to it - and maybe cover the shades with a fabric in green or pink - or both? I love it as is. If you want to make it colourful I'd add strings of pearls/beads in green and pink. I'm thinking fake jewellry here. You always have such a great taste. I'd add color shades. That is just gorgeous, gorgeous, gorgeous. You are so inspiring! I love the green and pink coordination. I like it as it is. Ribbons and such would be dust catchers. Lovely work you're doing. I think the bird lamp is great in your daughter's room but wouldn't care for for it otherwise. Leave it white, add pink shades and drape it with crystals. Oooohhhh....LOVE LOVE LOVE the chandelier! I would leave it white and put on pink and white gingham shade covers over each bulb...or green and white gingham... Very cute!!! No way! 99 cents - amazing. I absolutely LOVE the Hollyhock print. If you're ever looking to re-home it let me know! The chandelier has leaves - I'd paint it a pretty shade of green. Oh, you have to paint the chandalier and get some shades. I can just see it all painted up. Look at the ones from Pottery Barn for ideas. I think it is too fabulous to leave as is- painting it would take it from nice to "oh my goodness, that chandalier is so great!" We know you, you are talented and can pull this off. Is the chandelier going in Elise's Room/Baby Boy's Nursery? If so, I don't think I would fancy it up too much since the new Little One is already getting a healthy dose of pink in his room. That was a super-duper buy and I would have bought it for 99 cents even if I stored it until Elise was again in a room by herself. I just noticed you posted at 2am. I am sorry you had a sleepless night! 99 cents!! That's highway robbery! WOW! I, myself, would leave it white and put up some pretty shades. In Amelia's nursery, I used some coordinating fabric to cover the shades. I'm still on the hunt for some trim for them. I love that it's unique! That stove is so great! This is a darling nursery! as for the chandelier, depends on where you're hanging it, and it's purpose. I love the raw sparkly candle-ness of an unadorned chandelier, but the light may be too harsh at night for the little occupants. As for me, I love the "shabby chic" look..I'd leave it white and peeling!!! You got that for 99 cents??? I wouldn't paint it ... I love the shabby chic look of it. Give it some cute shades and you're set! What a lovely nursery/bedroom! I love pink and green together. The chandelier is wonderful...what a great find! It's sweet in white, with green shades, perhaps? I'd say pink, but I'm assuming you don't want to overdo the pink for baby boy's sake. Or, as Mrs. Happy Housewife suggested, paint the chandelier a soft green to bring out the leaf details. Maybe leave it white, and just paint the leaves? In either of these cases, I'd use white/cream shades. 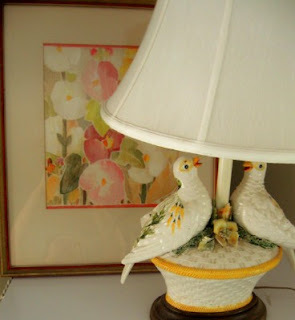 And maybe you could "nestle" a nest or a little white bird just above the leaves...to tie in your sweet birdie lamp. I also agree with Eleanor Joyce...put me in line if you ever decide to re-home that lovely hollyhock print! I personally love the bird lamp, just my two cents. I would leave the chandelier white and add green and white gingham shades. Love the look of the chandelier, as well as the price! Get a can of silver spray paint for the chandlier ...It would look great! I'd probably make it a more colorful tole style -- like the one in my girls' room or like this one. Well, I love everything you've done so far, and I know whatever you do with the chandelier will be fabulous. Why not just go over the top with it. Pink paint, strings of sweet beads, alternating pink and green gingham shades, ribbon trim. I love it! What a find!! I would leave the chandelier as it is. First of all I love the bargain. And I'd probably leave it white. Can't wait to see the finished product! Why not drape the chandelier with strands of ivy, and tuck in a few little bird houses and some tiny birds? That would pick up the leaf motif, and not be *too* girly for the bitsy boy. If you are concerned about too much light you could have someone install a dimmer switch in the room. Meridith, you are amazing. I LOVE what you are doing in that room. Everything looks so great. I really like your style. You've gotten lots of good comments about the chandelier -- I'm looking forward to seeing what you do with it. Wish I could hire you as a consultant. And WHERE did they have a 99 cent sale. I've never stumbled onto one. yes, all i would do is shades!!! Great deal on the chandelier! It looks good as it but if you want to spruce it up I'd put some sage shades on it (be neat if you could find the toile pattern that's on the cribskirt). Lovely chandelier. I would like to have one like that for Little's room. Maybe you could do pink shades with green ribbon trim or pink and green striped shades. Looking forward to seeing how you dress it up. I'd leave it white and look for some shades that have beading on them in clear or green. That way it would work for "itty bitty" (so cute!) or your daughter. I like the colored shades idea simply because they'll look cute and diffuse the light, making it warmer instead of just stark naked bulbs shining brilliantly in an otherwise lovely and calming room. How big is the room? My nursery is ridiculously tiny (yet it has a walk-in closet...go figure.) You have inspired me to think about redecorating. In fact, the walk-in closet is large enough to turn into a tiny nursery...if it had a window. How about draping a garland of crystal beads around it? That might look good, but it really is pretty as is. I would use green and white shades, and leave the chandelier white. I wouldn't use pink, or make it feminine for baby boy's sake. You've done it again..hooray for your resourcefulness, talent and panache! Regarding the chandelier, how about frosted bulbs on a dimmer switch, wrap the 'arms' with some strips of tulle, and adorn with pink crystals. Just remove the tulle and hand wash as added...low maintainence here! I avoid choosing things that are too fussy to clean. Want to play with the babies and streamline that process. *grin* Whatever you decide it will be great. I would go with shades. That will make it easy to change for future use. I've successfully gotten those thrifting for 50 cents a piece - they are kind of pricy at the regular store. I just had to tell you how much I love your nursery decorating! I like the bird lamp! :) I think the nursery is adorable. I follow your blog, and just wanted to tell you how much I enjoy it. I am a frugal, thrift store shopper too, and we do just fine! I always appreciate what you share. I would repaint it a richer white and then add shades, pink or green and glue light feathery material, like boa feathers or little pom-pom balls the same color as the shade. Glue this to the bottom of the shade. Trust me I saw this in a little girls room in a very stylish wealthy home and it was amazing. I didn't read all of the posts but paint white again if needed . What about some of the pink toile trimmed in green braid, ribbon or tassels or maybe even a green stripe with coordinating trim on the shades. The room is beautiful. You have such a better selection of thrift items in your area than we do. You are doing a fantastic job on the nursery! OK, I want this room for myself! You are awesome! The room is lovely! I think the lamp that your hubby does not care for has found a wonderful home! The chandelier is a great find. The best part is, whatever you choose to do with it now, can always be revamped later when tastes and needs change. It is a great addition! I didn't read all of the comments, so this might be repetitive, but I think it would look beautiful with green toile (matching the baby bed skirt) shades. I don't think it needs any paint--looks fine! The chandelier is exquisite in white. don't paint it! I would add colored shades only if the bulbs are too bright. If you use the frosted ones, like it appears to have in the front, you wouldn't need shades. 99 cents?!?! Wow, you find the best deals!! Some pretty pastel gingham shades . With rick rack trim around the edges . I also use water color pencils to draw designs on plain white shades that compliment the patterns and colors used in the room. If you can not draw you could transfer designs or images . I like your dove , lovebird lamp it is very whimsical and fits the english garden style of your daughter and infants room . The room feels very soothing. haven't popped over in ages...and so glad i did...i LOVE the look and LOVE the little chandelier. i'd say - leave it and add some dainty ribbon bows. 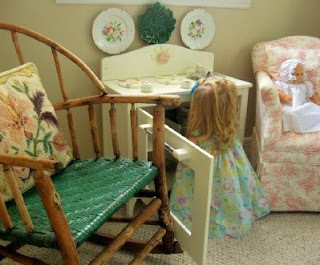 It is a very pretty little girl's room but I am anxious to see the boy nursery section. I know the baby won't care how feminine his surroundings are, but I'm sure you have something boyish planned for his corner of the room. Can't wait to see how you incorporate the decors for boy and girl. 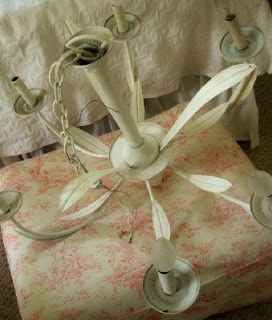 Because they are sharing, I definitely would not "frill" up the chandelier if you are using it in this room. If you go to the blog "My Romantic Home", she just refurbished a chandelier! Love the photos of her home. 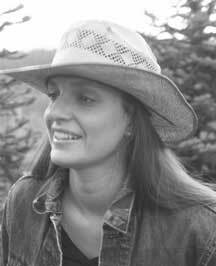 She was recently chosen and filmed for a show on HGTV. What a beautiful room! the chandelier was quite a find, you do have a gift and an eye for finding treasures. I would consider leaving it white and adding shades in any of the colors you are using since they blend so nicely together. What about adding some crystals on each arm? you can buy ones that have a very small magnet that just sticks them on--or just make them yourself with some recycled crystals and add the small magnetic jewelry clasps that you buy at the craft store the light shining through crystals makes great rainbows to entertain the little ones lacking a chandelier -- I hug some on the window in my sons room when he was a little one he loved following the rainbows! 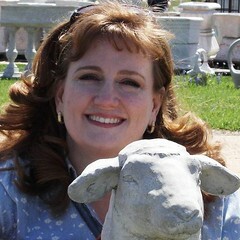 I just found a shop online (via Romantic Cottage) called Lavender Fields . Readers who like your color palette will enjoy the finishes they use and they are having a great contest . Post a picture of the bedroom you want redecorated , and the bedroom that everyone choses wins a complete Pine Cone Hill bedding ensemble . WOW !! !